Chances are you may have seen one yourself, but just how well are Facebook mobile ads promoting app installs performing? AdParlor, one of Facebook’s advertising and marketing partners, has provided us with some data to show that the answer is rather well, although the experience of another developer points to some of those good gains possibly being short-lived. The gains of a strong app install model are potentially not just good news for developers — who need more than app store rankings these days to get their apps seen, installed and used — but also investors — who need to keep seeing evidence of solid business models in Facebook’s business. AdParlor recently ran a four-week campaign with a large global gaming company (it doesn’t say which one), with app instill ads placed in the mobile news feed. AdParlor found News Feed ads to be one of the most engaging and effective ad placements on Facebook’s platform at the moment, with average click-through-rates of 0.5% (ie, how many people click on the ads) and sometimes higher depending on the vertical. 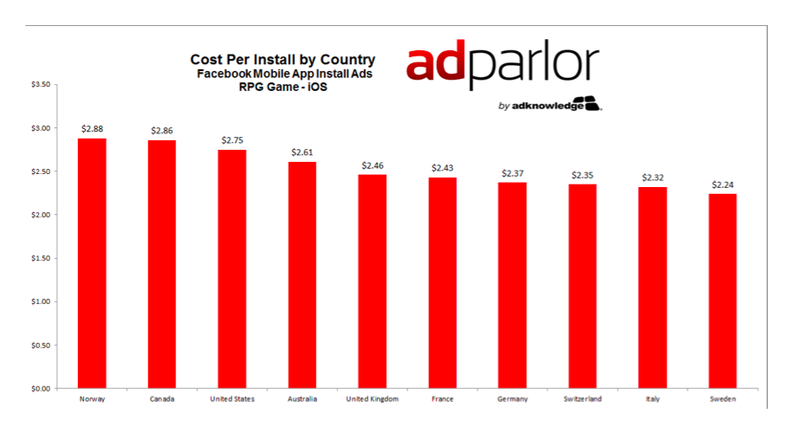 What these numbers, all under $3, show is that the cost-per-install — meaning the amount of money it is costing developers to get users to act on their ads — is still remaining relatively low. In other words, a lot of users are clicking on the ads and downloading. That’s something Kate Smillie, a product director at app developers Miso, has also noted, with even more cost-effective results: Miso recently decided to buy mobile ad units on Facebook’s mobile platform to promote a new app, Quips, along with ad units on two other networks, mDotm and Tapjoy. Their conclusion: Facebook far and away had the best results, with $0.45 Average cost-per-click (CPC) (not install); a 26% conversion rate of installs (actions) to clicks, with the average cost per user at $1.73. — People may become more inured to mobils news stream ads the more they become accustomed to them. “When I first ran these campaigns I had never even seen a mobile install ad in my Newsfeed despite my best efforts to find one,” she writes. “Now it seems like I see one every time I open Facebook on iPhone.” And, as has been the case with a lot of other ad units, users will “see” (read: register) these ads as they become more and more prevalent. — She also notes that cost-per-click bids are going up to over $1.00 in some cases, while the range used by Miso was more like $0.20 to $0.50. “Bids change depending on the target audience, so it’s not surprising to see higher demand for socially active college grads with iPhones,” she writes. Two possible morals for the story for now: if you’re a developer wanting to tap this ad unit for your own app, best do it tout suite. But with Facebook last quarter making 15% of all its revenues, $150 million, from mobile ads, expect the social network to introduce more ad units into mobile to counterbalance some of the relatively older ones performing less well. If Facebook mobile app install ads continue to perform well once users acclimate to them, Facebook could have another big revenue stream on its hands. The app economy continues to heat up as every company and game developer goes mobile. But discovery through the App Stores is tough until you reach the top of the charts. So Facebook could position itself as the best way to buy legitimate installs, making it a core part of marketing spend for all developers. And this is also why app install ad performance is important to everyone, not just developers. Facebook has to keep piling up solid revenue streams to make it worth betting on for investors.